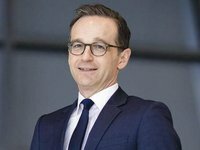 Ukrainian Foreign Minister Pavlo Klimkin during a meeting with German Federal Foreign Minister Heiko Maas discussed the issues of the release of Ukrainian prisoners of war and the situation of the civilian population in the occupied territories of the Ukrainian Donbas. The meeting took place in the framework of Klimkin's participation in 25th OSCE Ministerial Council on December 6, the press service of the Ministry of Foreign Affairs of Ukraine said. The parties also agreed to continue the dialogue within the framework of Klimkin's working visit to Germany next week. "Ukraine counts on Germany's further leadership in making a strong and comprehensive EU's response to the Kremlin's belligerent rhetoric and aggressive actions that threaten the security of the Euro-Atlantic space," the message reads.